But I better have a back up plan just in case. Hey, how about a drive in diner meal? Hamburger, onion rings and a milkshake. Oh yeah, this sounds like a great reason to come to the dinner table. If I had my rollerskates still, I could roll from the kitchen with it! My husband is shaking his head no. Oh rollerskates...how I loved you. I saved my money to buy them, well I saved half the money and my parents covered the rest. (But I made the purchase, so you know....I bought them.) I coveted these skates for months before the purchase was made. The skates were beautiful.....blue suede. 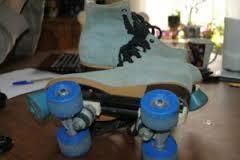 Not actually my roller skates, but I did have the blue indoor wheels and I also had the yellow outdoor wheels. Yeah, I had indoor and outdoor wheels....'cause that's how I rolled. Get it! I'm here all night....try the milkshakes! Anyhoo......I'm guessing since these are milkshakes, ice cream will be involved. I did get an ice cream attachment for my KitchenAid. (This post.) But I haven't gotten around to actually making ice cream yet. And I've had it for a full week! (public shaming in 3-2-1.) Oh, and I received the new book I ordered, David Lebovitz's Perfect Scoop. So excited!!!! The keener in me wants to make my own ice cream, to use for these milkshakes. The realist in me is wondering what brand of ice cream to buy. Silly reality...bein' all real and stuff. Breyer's. Hubbie went out and bought me Breyer's ice cream. Yes, I once again didn't make ice cream. But my ice cream bowl is still in the freezer, so it could happen at any moment, people! That's right, ice cream could be made at any moment! The power of the ice cream is strong in this one. But not right now. Now this is one easy recipe. Perfect for the lazy days of summer. Not many ingredients needed at all....five in total. Vera's Burgers (from the Butchery) and Alexia Onion Rings are going to make up this drive in diner meal. Hubbie is out BBQ'ing the burgers, while I bake the onion rings and blend up the milkshakes. This shake just got real. And here are the milkshakes with their drive in diner companions! This video is for my hubbie....because he sang this song when I brought out the dinner tray, and I thought this was the perfect song to go with this meal!! He's my music man! Hey, there wasn't a tip on my tray at the end! I think I need to come eat at your house! Eveything looked great! Adorable! Love the diner theme. Ohmigosh -- burgers, onion rings and milkshakes... that sounds like *the perfect* summer meal. Looks fantastic! Yum! Love the pairing with burgers and onion rings. I bet fries would be super tasty dipped in these shakes! Great post. I will be following you on bloglovin'.